Barcelona's El Prat airport surpassed for the first time ever the yearly 50 million mark in passengers in 2018. According to figures published on Monday by the public company managing Spain's top airports, 50,172,457 people took off or landed with a flight in Barcelona last year. This means 6.1% more than the previous year. The international flights were up by 6.2% last year to reach 36.6 million passengers, whereas the domestic ones were also on the rise by 5.7%. The December 2018 crucially contributed to reach the 50 million mark, with 3.4 million people using the infrastructure, 9.5% more than twelve months before. In 2009, 27.4 million people started or finished their flight journeys at Barcelona El Prat, almost half compared to 2018. Ever since that year the figure has risen yearly without interruption. In 2017, the Catalan capital's airport was the sixth most used in the EU, only preceded by Heathrow (London), Charles de Gaulle (Paris), Schiphol (Amsterdam), Frankfurt and Barajas (Madrid). In terms of cargo flights in 2018, the trend also is upwards, with 10.8% more tons handled at the airport than one year ago to reach 172,940. Barcelona-El Prat airport also hit the headlines few weeks ago, when the Spanish government decided last December 21 that it would rename it adding 'Josep Tarradellas' to it –Tarradellas was President of Catalonia in exile during general Francisco Franco's dictatorship. Meanwhile the other two major Catalan airports, Girona and Reus, were also slightly on the rise. The one in northern Catalonia got 2.01 million passengers, some 3.8% more than in 2017. This way the infrastructure continues a recovery for a second year in a row, although it is still far from the all-time best 5.5 million, reached in 2008. 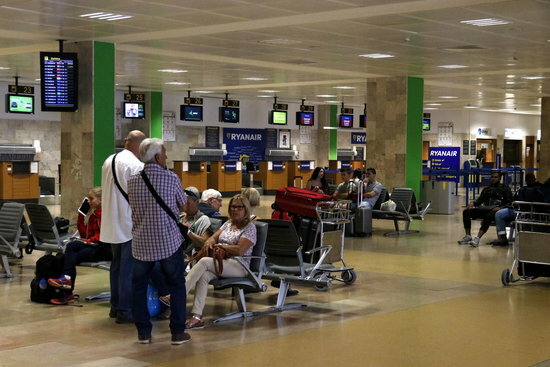 Reus airport, in the south, also slightly increased its users (1.8%) to reach 1.03 million. Its all-time best was in 2009, with 1.7 million.